The Mississippi Valley State University Mock Trial Team ended the season competing in the Jackson Regional Mock Trial Tournament held at the Mississippi College School of Law in Jackson. Pictured from left are Dr. Larry Chappell, advisor; Jasmine Murphy, Dr. William Bynum, MVSU president; Kenya Junes, Alexxus Ervins; second row, Kambreca Mitchell, Barbara Duncan, Destaree Simmons, Laquita White and Neysha Sanders, Esq. 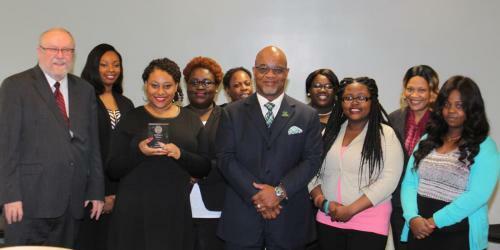 The Mississippi Valley State University (MVSU) Mock Trial Team recently competed in the Jackson Regional Mock Trial Tournament held at the Mississippi College School of Law in Jackson. MVSU competed against The University of Alabama at Birmingham, The University of Georgia, Tulane University and The University of North Alabama. Jasmine Murphy, sophomore pre-law/legal studies and English double major from Itta Bena, Miss., won an outstanding witness award for the defense for her role as Dr. Vic Fogel, an expert on journalism. She also received strong scores and rankings for a separate role as psychologist Cary Kramer on the plaintiff side. This was her second outstanding witness award in less than a month. The other members of the team include Kenya Jones (team captain) junior double major in pre-law /legal studies and government and politics from Meridian, Miss. ; Nadia Crawford, sophomore pre-law/legal studies major from Atlanta, Ga; Barbara Duncan, first year double major in english education and pre-law/legal studies from Schlater, Miss. ; Alexxus Ervins, first year pre-law/legal studies major from Laurel, Miss. ; Tiwana Frazier, sophomore pre-law/legal studies major from Leland, Miss; Austin Gray, first year double major in English and pre-law/legal studies from Cleveland, Miss. ; Kambreca Mitchell, sophomore pre-law/legal studies major from Greenwood, Miss. ; Jakaiyla Procter, senior Criminal Justice major from Chicago; Destaree Simmons Junior major in Criminal Justice from Glendora, Miss; Laquita White, senior double major in Criminal Justice and Pre-law/legal studies from Greenville, Miss. 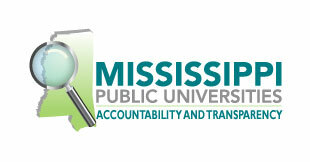 “We want to especially thank John McCall, senior graphic designer with Communications and Marketing at MVSU, for preparing the demonstrative aids that students used in their testimony; and Dr. John Bradford, assistant professor of sociology, who developed the charts that were used in testimony during the trials. The educator coach for the Mock Trial Team is Dr. Larry W. Chappell, university pre-law advisor, professor of political science and coordinator of the pre-law/legal studies program. The attorney coach for the team is Neysha Sanders; Esq. Sanders is a member of Sanders and Sanders Law Firm. She also teaches courses in the department of social sciences at MVSU. The assistant coach for the tournament was Ivory Johnson, a student who won eight outstanding attorney awards competing at Mississippi Valley State University. Supervisors, Office of Academic Affairs, and University Advancement.